If you ever find yourself down by the sea, you may come across some very flamboyant sea slugs call nudibranchs. But beneath their colourful exterior, some of them are harbouring a dark secret in the form of a very strange looking parasite. 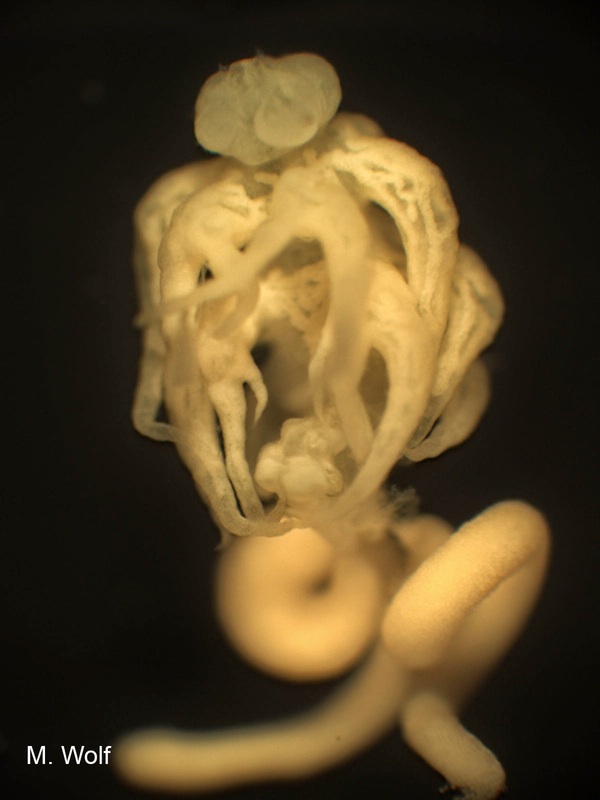 These parasites live hidden inside the main body cavity of their molluscan host, so if you are unfamiliar with this particular critter, you might not even notice it. The main thing that gives away their presence are a pair of egg sacs poking out of the sea slug (see photo on the right). Those egg sacs belong to a parasite call Ismaila belciki - it is a crustacean, though it looks more like one of Cthulhu's lovechild or something out of Men In Black. Ismaila and other copepods of the Splanchnotrophidae family are specialist parasites of sea slugs and they can get pretty big in comparison with their host, taking up substantial room and resources. 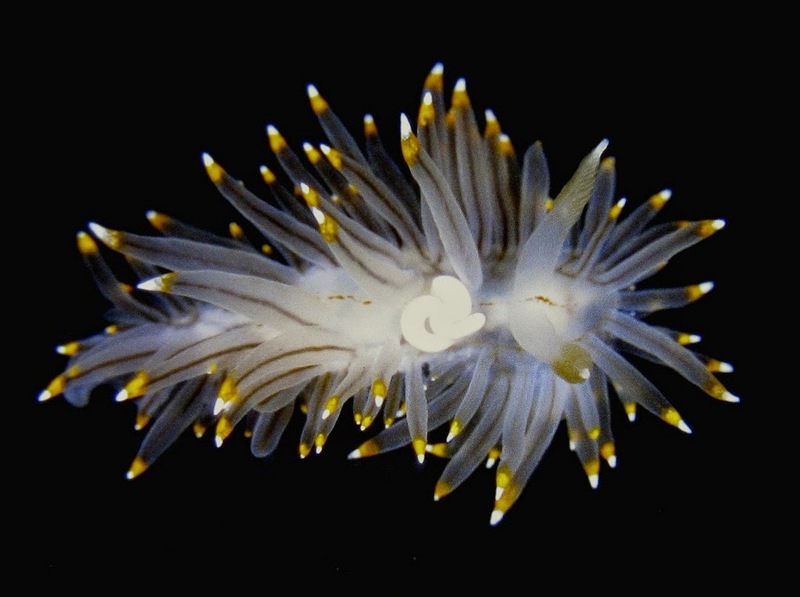 Ismaila belciki infects Janolus fuscus, a nudibranch found along the west coast of North America from Alaska to California, as well as the shores of northern Japan. In some areas, such as Coos Bay, Oregon where the study we are featuring today took place, up to 80% of the slugs are infected with this odd creature. Having such a big parasite sitting in the middle of slug's body soaking up nutrient obviously carries some kind of cost - but just how much? embraced dwarf male front and centre. A pair of researchers from University of Oregon decided to find out just how costly this parasite is to its host. They compared the growth, survival, and reproductive capacity of infected and uninfected J. fuscus, and measured how much resources the parasite takes up. While I. belciki did not seem to interfere with sea slug's growth, infected slugs do have a lower survival rate. Additionally, they have shrunken gonads that are only capable of producing about half as many eggs as healthy slugs. But the reproductive capacity of those afflicted sea slug suffers not just in terms of quantity, but in quality as well. In addition to producing fewer eggs, infected slugs also produced eggs that were smaller, and the baby slugs that hatch out of them also have lower survival rates. So it seems I. belciki can be very harmful indeed, but it cause even greater harm if the parasite itself is breeding. The researchers noted that I. belciki bearing developing egg sacs exert a greater toll on the host than egg-free parasites. A female I. belciki is an egg-laying machine that can churn out over 88000 embryos per month and all the expenses for that are paid for by the host. To fuel the development of its eggs, I. belciki draws from the same pool of resources that the host normally use for its own egg production. Slugs with brooding I. belciki produce even fewer eggs than those that are "just" stuck with an egg-free parasite. It is as if the sea slug is a factory that has been retooled from solely making slug babies into one which now has to divert some of its attention and raw material to making parasite babies too, via a proxy in the form of a female I. belciki. Given that Janolus fuscus usually only live for five months, by shorten their lives and severely reducing their reproductive capacity, I. belciki might actually be putting a natural check on the population growth of these flamboyant nudibranchs. Wolf, M., & Young, C. M. (2014). Impacts of an endoparasitic copepod, Ismaila belciki, on the reproduction, growth and survivorship of its nudibranch host, Janolus fuscus. International Journal for Parasitology 44: 391-401. P.S. I will be attending the annual Australian Society for Parasitology annual conference in Canberra, Australia between 30th June to 3rd July. So watch for tweets about highlights from conference at my Twitter @The_Episiarch! Meanwhile, I have written a article for The Conversation about the crab-castrating barnacle Sacculina carcini - you can read it here. The parasite in the study being featured today makes a living riding around on the top of a fish's head and occasionally gnawing on its face. It is in the same family as the infamous tongue-biter, the Cymothoidae, though technically this one is more of a face-hugger. 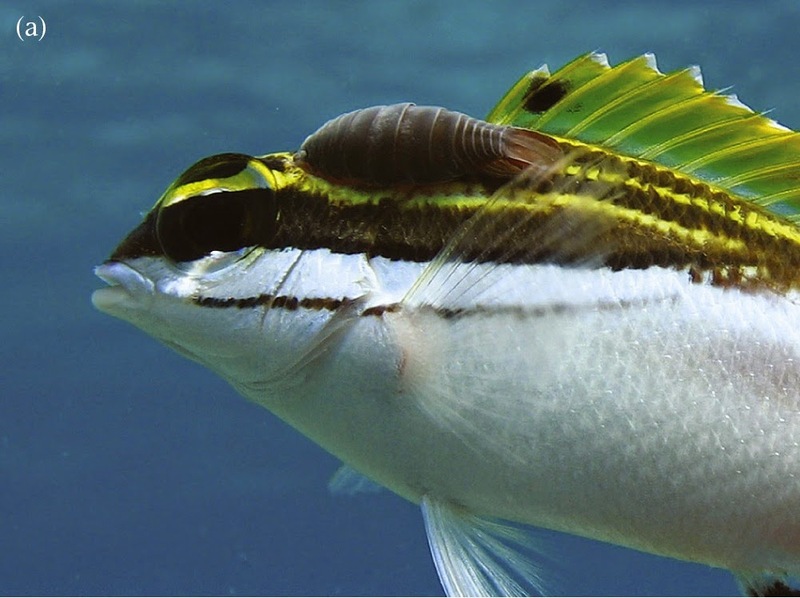 Anilocra nemipteri is found on the Great Barrier Reef of Australia and it makes a living by hitching a ride (and feeds) from the bridled monocle bream, Scolopsis bilineata. It is a pretty common parasite - in some areas, up to 30 percent of monocle bream carry one of these crustaceans on their head like a nasty blood-sucking beret that stay attached for years. As you can see from the photo, A. nemipteri is a fairly big parasites comparing with the size of the fish (in some case they can reach as almost one-third the length of the host fish! ), and having a parasite of that size hanging off your face is going to be quite a drag - literally. That is bad news for a little fish like the monocle bream that needs to make a quick getaway from any hungry predators on the reef. So just how much of a drag is A. nemipteri? A related species - Anilocra apogonae - which clings to the cardinal fish (Cheilodipterus quinquelineatus) is known to cause their host to swim slower and have lower endurance. Does the same apply for A. nemipteri and the monocle bream? To find out, scientists compared how quickly the fish can respond to an attack and their Flight Initiation Distance (FID) in both a laboratory setting and in the field. The FID is the distance from a predator at which an animal decides to flee - risk-takers have a shorter FID. They divided the monocle bream into three different groups: parasite-free fish, fish carrying an A. nemipteri, infected fish which just had their parasite removed. The research team simulated an attack by a bird (with a weighted PVC pipe) on fish in specially-designed experimental tanks and filmed the response to measure the fish's reaction time to the attack. Even though one would think all that face-gnawing from A. nemipteri would have weakened their host, and not to mention the body of the parasite itself causing significant drag, the escape performance of parasitised fish was not all that different from unparasitised - they reacted and got away from the attack just as quickly as their unburdened buddies. In the field experiment, the scientists donned snorkelling gear and tried to approach any monocle breams they spotted and measured how close they could get to the fish before they fled. There, they found parasitised fish have a slightly shorter FID than parasite-free fish, but not significantly so. Fish that are infected by A. nemipteri are smaller than uninfected ones, and it just so happen that smaller fish tend to allow predators to get closer to them before fleeing. But whether this is due to the parasite is another matter. Are parasitised fish smaller because their growth have been stunt by A. nemipteri? Or does this face-hugger simply prefer smaller fish because larger and older fish might have built up an immunity to it? Though it may seem less exciting when we find a parasite doesn't cause much behavioural changes in its host, it is vital to our understanding of host-parasite relationships. Perhaps it means the host is able to compensate for the presence of the parasite. Also it is not clear what the long term cost of having A. nemipteri might be over the life time of the fish. It is also important to treat such a case in its context. Unlike other parasite which have a complex life-cycle and depend upon its host getting eaten by a predator to reach maturity, A. nemipteri is an external parasite that simply sticks to a host and stay for life - if the parasitised fish is eaten by a predator, it'll go down with the host like a bit of garnish and be digested too. So it is probably just as well that A. nemipteri is not too much of a drag to have around. Binning, S. A., Barnes, J. I., Davies, J. N., Backwell, P. R., Keogh, J. S., & Roche, D. G. (2014). 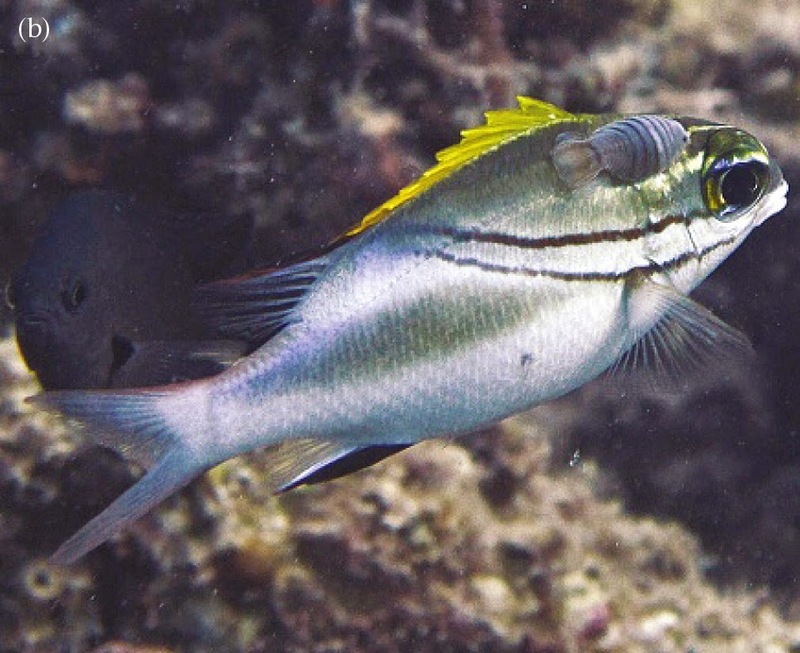 Ectoparasites modify escape behaviour, but not performance, in a coral reef fish. Animal Behaviour 93: 1-7.